I’ve never been one to change skins too often. When I find a skin I really like, I tend to keep it and just keep tweaking my face because I always feel like I can make it BETTER. My beloved Briar skin is being retired, though, and I realized I was going to have to find a new “everyday” skin soon. I’ve been waaaaaitingggg for the Pink Fuel Kumi skin to be released and finally tonight it was! I didn’t do too much Photoshop to that pic, just adjusted the light a bit. What a long, long weekend. I adore my family. I put them above everything else in my life. But so much forced togetherness…you know. 🙂 My mother wanted to stay in the hotel with my aunt & cousin, so I agreed to do it. I also agreed to drive everywhere they wanted to go. In for a penny, in for a pound, right? I am so thankful to my plurk buddies, though! Oh, they so kept me sane over the weekend. They kept me from going Ali-credible Hulk in the mall yesterday when I was shopping with my 5 foot nothing, 100 pound mom, aunt and cousin and had to hear “I can’t wear sleeveless, my arms are too fat” for the 20th time. It was nice to get home to my quiet house, and cuddles with my kitty, and log into SL. The island never looked so good. My plurk buddies also helped me discover the wonder that is Pocket Metaverse. Only I couldn’t figure out how to accept inventory using it, and that’s really what I needed! You see, all weekend when I’d check my email, I’d see things being dropped off for me. And well, you guys know SL. Messages can cap for no reason. [It’s 2010, can we get that fixed?!] I was really getting itchy to get into SL, even for a minute, because I so so so badly wanted to get the new Belleza skin – Elle! Squeeee! I love it! I may still love the Belle skin more, though. But everyone needs an upgrade, and this one is just so so so pretty. It’s probably been covered on the feeds like mad this weekend. I know it certainly was on plurk! If you’re in the Belleza group [$250L joining fee if you aren’t in it already], there’s a free skin for you. I’m heading back in world to play. Crashtastic party, but lovely lips! I actually wasn’t going to go. I wanted to, but…you guys know me and crowds. But I was talked into it by Isabeau, who told me if I didn’t like it, I didn’t have to stay. Oh. LOL Sometimes you just have to be told something that simple for it to click. It was a VERY fun party, though. However, I was crashtastic everytime I tried to move my cam around. 😦 Tyson and I went back later after he logged in, but he seemed to be crashtastic too. It was slightly more stable for me in the evening, but not very much. But, it was fun. 🙂 Annnnnd I had to buy a new skin. I was going to choose an everyday makeup, but this one was just too fun to pass up on. Of course, now I want more more more! This is Sienna in You Love Me. I love the little heart lippy! If you are looking for the BBBC sign up post, click here. If you’re looking for Monday’s topic, it’s right here. Sometimes tinting your eyebrows when your hair is a different color other than brown/black [the standard eyebrow color in Second Life] can add a subtle effect to your overall look that is very fashionable. To begin, make sure you create a backup copy of your skin and hair base by right clicking on them in your inventory and right click to paste. While you should be able to make changes again after you modify the eyebrows, it’s always a good idea to have an original backup. Set your Eyebrow Size to 100 for the best results when tinting your eyebrows. For more coloring, also set the Eyebrow Density to 100. If you want a lighter tint to your brows, then you can play with the Eyebrow Density to get the intensity of the tint the way you want it. After you have set the Size and Density, click on the Color tab. 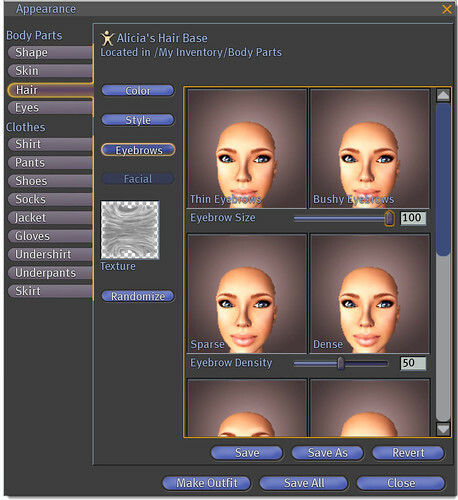 You will now be able to move all the sliders around and find just the right tint for your brows! As you can see here, when I move the Rainbow Color and Red Hair sliders to 100, I get a nice pink brow. But you can use all the sliders to match your brows for blonde, red, or even blue hair. Once you have the color you want, click on Save and you’re done! Have fun playing with your new eyebrows!